REFLECT is an evidence-based minimum set of items for trials reporting production, health, and food-safety outcomes. The aim of the REFLECT Statement is to help authors improve the reporting livestock trials with production, health, and food-safety outcomes. We have focused on both types of randomized trials, field trials and challenge studies in livestock, and the interventions may be therapeutic or preventive. 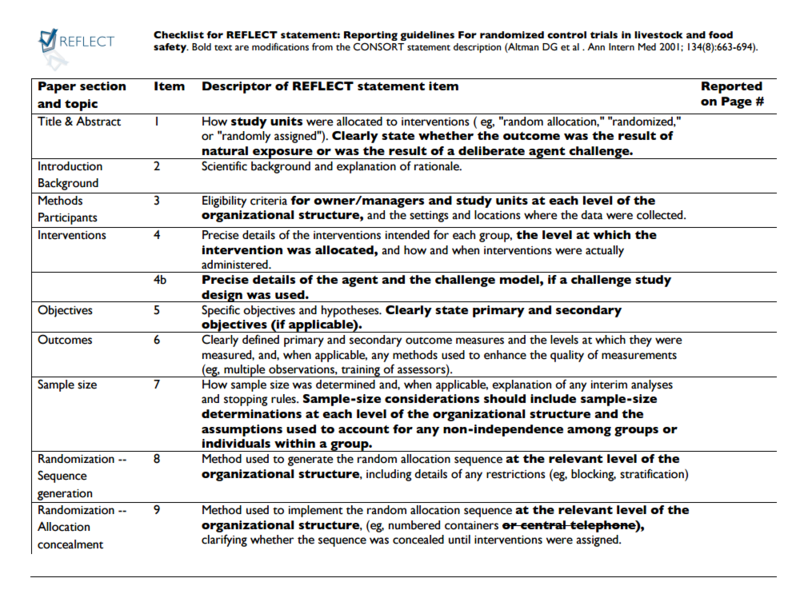 The REFLECT Statement consists of a 22-item checklist. It is an evolving document that is subject to change periodically as new evidence emerges. This website contains the current definitive version of the REFLECT Statement. Want an easier way to fill out the REFLECT checklist? O'Connor, A.M., Sargeant, J.M., Gardner, I.A., Dickson, J.S., Torrence, M.E. and consensus meeting participants: C.E. Dewey, I.R. Dohoo, R.B. Evans, J.T. Gray, M. Greiner, G. Keefe, S.L. Lefebvre, P.S. Morley, A. Ramirez, W. Sischo, D.R. Smith, K. Snedeker, J. Sofos, M.P. Ward, R. Wills (2010), The REFLECT Statement: Methods and Processes of Creating Reporting Guidelines for Randomized Controlled Trials for Livestock and Food Safety. Journal of Veterinary Internal Medicine, 24: 57–64. doi:10.1111/j.1939-1676.2009.0441. The REFLECT Statement: Reporting Guidelines for Randomized Controlled Trials in Livestock and Food Safety: Explanation and Elaboration. Sargeant JM, O'Connor AM, Gardner IA, Dickson JS, Torrence ME, Dohoo IR, Lefebvre SL, Morley PS, Ramirez A, Snedeker K.
J Food Prot. 2010 Mar;73(3):579-603. Sargeant JM, O'Connor AM, Gardner IA, Dickson JS, Torrence ME; consensus meeting participants*, Dohoo IR, Lefebvre SL, Morley PS, Ramirez A, Snedeker K.